Wee Lil' Blog: A Rockin’ Green Giveaway! 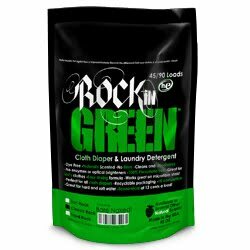 With all of this talk about laundry this week, we thought it only fitting to do a Rockin’ Green giveaway too. So one lucky blog reader will win their choice of any one in-stock Rockin’ Green “flavor”! Click the “shop our store” button to the right and find the Rockin’ Green page. Look over the in-stock scents and come back and tell us, in a comment on this post, which one you’d choose if you won. This is your mandatory entry and must be completed before any other entries will count. The Rockin’ Green giveaway is open from November 5, 2010 through November 18, 2010 at 9pm EST. A winner will be announced on the morning of November 19, 2010. The winner has 48 hours to contact us. If we haven’t heard from them by then, another winner will be chosen. Please note this new rule: Entrants may not enter to win using “anonymous” but must enter using an actual name. Each entrant must complete the mandatory entry before completing any extra entries for them to count. There is a limit of one mandatory entry per contest not per day. The bag pictured above is an example and not necessarily the exact prize the winner will receive. Again, the winner will choose the scent. Please include your email address in your comment in case our winner can’t be reached so a new one can be chosen. This contest is subject to change at the discretion of Wee Little Changes. I would like to win the Unscented/Bare naked babies! OH, how I *heart* RnG!!!! I would try Orangevana! I would get Bare Naked Babies. Such cute names for scents! I follow the wee little changes blog with GFC #! I would most definitley choose smashing watermelon...yum! Bare Naked Babies Hard Rock is my pick! Fan of RnG on facebook! I'd like to try Bare Naked Babies! FB fan of Rockin' Green! I'm a FB fan of Rockin Green. I would love love love to try the smashing watermelon!! I am a fb follower for Rockin' Green !! I love Rockin Green! Thanks for this awesome giveaway. My favorite scent is rage against the raspberry. If I won I would choose smashing watermelons in classic rock! I would like the unscented. I like Rockin' Green on FB. I'd choose the Bare Naked Babies! I would choose smashing watermelons. I'm a FB liker of WLC! Id love to try the Plain Green Teas scent. Rage against the Raspberry sounds great! I would get Smashing Watermelons. Like Rockin Green on Facebook. Heehee I just ordered your last bag of Hard Rock Rage Against The Raspberries and I'd probably pick it again! Love it!